Sol. Veteran Bengali film actress and Padmashri awardee, Supriya Devi, passed away in Kolkata, following a severe cardiac arrest. She was 83. Sol. India and Cambodia signed four agreements in the field of cultural exchange, an exchange line of credit of $26.9 million, memorandum of understanding to cooperate in legal matter and an agreement on prevention of human trafficking. Sol. The Chief Minister of Himachal Pradesh, Jai Ram Thakur launched the ‘Shakti’ app for women’s safety in the state. The app, which comes with a panic button, was developed by the National Informatics Centre (NIC) of the Himachal Pradesh government. Sol. In the Australian Open 2018, Roger Federer was the defending champion and successfully defended his title, defeating Marin Cilic in the final. Marin Cilic is from Croatia. Sol. The Indian Institute of Corporate Affairs (IICA) and India Post Payments Bank (IPPB) has signed an agreement for the training of employees of the latter in the area of payment banking. Q6. 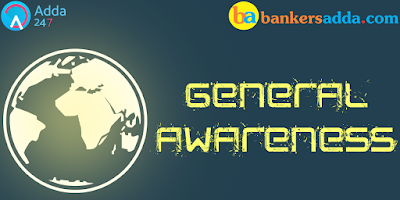 In which state, Andhra Pradesh Grameena Vikas Bank (APGVB) has operationalised its first desktop ATM? Sol. The Andhra Pradesh Grameena Vikas Bank (APGVB) has operationalised its first desktop ATM in Telangana. The mini-ATM within the branch premises will facilitate customers to withdraw small amounts. Q7. The NABARD has sanctioned _____________ crore loan assistance under the Rural Infrastructure Development Fund (RIDF) to Odisha towards irrigation and rural bridge projects for the last quarter of this fiscal. Q8. Which among the following country will host an informal WTO Ministerial gathering in March 2018? Sol. Trade ministers from various countries including Australia, Japan and Switzerland met for an informal WTO ministerial gathering in Davos, Switzerland. India was represented by Deepak Jagdish Saksena, ambassador and permanent representative to the WTO. India announced that it will host an informal WTO Ministerial gathering in March 2018. The meeting would be held in New Delhi on March 19-20. Q9. The world no.1 Tai Tzu Ying has recently won the Indonesia Masters in Jakarta. She is from which country? Sol. The world no.1 Tai Tzu Ying of Taiwan has defeated Saina Nehwal in the finals of the Indonesia Masters in Jakarta. Q10. The 60th Annual Grammy Awards were held recently in New York City, the USA. Who was the host of the ceremony? Sol. The 60th Annual Grammy Awards, honoring the best achievements from October 2016 to September 2017 were held at Madison Square Garden in New York City, the USA. James Corden was the host of the ceremony for the second year in a row. Q11. In the 60th Annual Grammy Awards, ______________ was awarded 'Best Music Film'. Sol. In the 60th Annual Grammy Awards, The Defiant Ones was awarded 'Best Music Film'. Q12. Who is the governor of Assam? Q13. Capital of Angola is? Q14. Manas Wildlife Sanctuary is situated in which of the following Indian state? Q15. In the Australian Open 2018, Caroline Wozniacki has defeated ____________ in the final of Women's Singles. Sol. In the Australian Open 2018, Caroline Wozniacki of Denmark has defeated Simona Halep of Romania in the final of Women's Singles.